Amy Saltzman, a researcher of mindfulness education, stated that, “One of the primary ironies of modern education is that we ask students to “pay attention” dozens of times a day, yet we never teach them how.” In the MindUP program, students participate daily in deep belly breathing, or “brain breaks,” as we call them, in order to slowly learn how to focus their attention. Studies of the impact of deep belly breathing have been done on everyone from stressed out medical students, to hardened criminals sitting in maximum security prisons, to kids with ADD and ADHD. The results are generally the same. Not only does it increase focus and attention, it improves pro-social behaviour, enhances daily happiness, and increases levels of calm while decreasing stress and anxiety. From a neurological or physiological perspective, deep belly breathing slows the heart rate, lowers blood pressure, and sharpens the minds ability to focus and learn by slowing down the amygdala and supporting the higher brain function taking place in the frontal lobes. One of the other benefits of deep belly breathing is the control it gives participants over their emotions, their learning, and their own lives. When I completed my own research on mindfulness education as part of my Masters degree, one of the surprising outcomes of my research was discovering that my students were using deep breathing in other aspects of their lives. While I had not discussed applying deep breathing to anything outside of the classroom, I discovered that they were applying this calming strategy to dozens of life experiences outside the classroom including diffusing conflicts with parents, calming anxiety before a big game, helping with sleep, and managing homework. In addition, they were teaching their families what they were learning. Below are some of my favourite pictures that came from a journal entry on ways students had used deep breathing in their own lives. In my class, I start students off by reading a script that helps them focus on their breath. To start, we aim for about 1-2 minutes, depending on the age of the children. In my class, I ring a resonating tone bar which, when repeated each day, signals the brain to focus. As they become better able to focus on their own I slowly reduce the amount I say until I eventually say nothing at all. Please sit comfortably in your chair, sitting tall so the air can fill your lungs. I invite you to close your eyes. When I ring the chime, listen for as long as you can. When you can’t hear it anymore, slowly begin your deep belly breathing. If your mind wanders, that’s okay, just focus your attention on your breath. When I ring the chime again, keep breathing calmly. When you can’t hear the sound anymore slowly open your eyes but stay still and quiet. Deep Belly Breathing takes practice. Here are a few ways students can begin to understand and practice deep belly breathing. Hobermann Sphere: Have students slowly inhale while you slowly expand the Hoberman sphere and then exhale as you slowly shrink the sphere back to its original size. This is also a great way to demonstrate the expansion of the lungs. Bubbles: Have students practice a deep inhale and then slowly exhale as they blow bubbles. Back to Back: Have students sit on the floor back to back. One student begins by inhaling deeply. The other partner should feel the expansion in their partners back as they breathe deeply. Take turns back and forth. Pinwheels: Have students practice deeply inhaling and then using the exhale to control the speed of the pinwheel. Objects on the stomach: Have students place a small stuffed animal or object on their stomachs. As they breathe deeply, they should feel the stuffed animals or objects rise and then fall when they exhale. For younger students, you can tell them their job is to rock the stuffed animal to sleep using the rise and fall of their stomachs. Flower and Candle Breathing: Have students clench their fist as if they are holding a flower. Have students pretend to smell the flower by deeply inhaling. Students then pretend they are holding a candle and slowly exhale to blow out the flame. Cotton Balls: This game doesn’t mimic deep breathing but demonstrates that breathing takes practice, controlled breathing, and focus. Students get into partners standing a good arms length apart. Students begin by blowing the cotton ball at their partner. The goal is to hit their partner with the cotton ball using only their breath. When done, students stand with their feet apart. They then take turns trying to score a goal by blowing the cotton ball through their partner’s feet. Finally, each individual student places their cotton ball on the palm of their hand. Their challenge is to slowly blow the cotton ball to the tip of their index finger without blowing it off the hand. The amygdala is such a small part of the brain, and yet it plays such a huge role in our ability to function optimally. I was recently at the National Middle Levels Conference in Portland and had the opportunity to hear Shauna King, from UpsideDown Organization, talk about the brain science behind bullying. She talked a lot about the amygdala, and she wisely compared it to a palace guard. I had never heard this comparison drawn; however, it made perfect sense. Like the palace guard, the amygdala’s job is to protect above all else. Information and emotions need to get past the palace guard to get to other parts of the brain. If the palace guard deems it safe or pleasurable, the information is let in. If the palace guard feels it is too dangerous, it will stop information at the gate and prevent it from moving on. Put the palace guard on a state of constant high alert and it is no longer distinguishing between real threats and perceived threats. The gates are closed and nothing is getting by. In addition, you can also send the palace guard into fight, flight, or freeze mode. When you get to this state, your palace guard, or your amygdala, has taken over but at the expense of the frontal lobes where learning, critical thinking, problem solving, and focus take place. 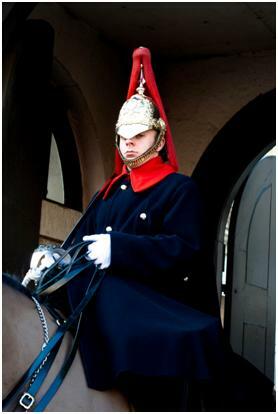 If you have ever had an opportunity to visit London and see the palace guards in action, you will know they lack all emotion. On a past trip to London, I remember watching a child frantically waving his hands and trying to get the attention of one of the guards. I also remember the look of confusion on the face of the child when he was met with no response. 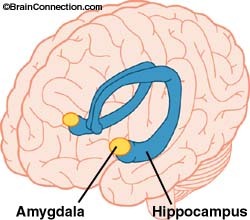 This is where the amygdala and the palace guard differ. The amygdala remembers the emotions behind memories. Take a moment to think about a happy memory. If you are like many of the students and adults I teach, you will find yourself starting to smile and will feel a certain sense of happiness. Your brain has encoded the emotion behind that memory. In the same way you felt happiness at remembering a joyful memory, you also encode the emotions behind memories that are not so happy. In children, the memory may be distant, or even gone, but the emotion behind the memory is still there. For example, a couple of years ago, I had a student who came from a family that was less than kind to him. When another student teased him, he flew into a rage I had never seen in him before. Once he was calm, I asked what had happened. He started by telling me he didn’t know but, as he talked, he related the issue in the class to similar teasing at home by a parent. When the student teased him, he didn’t think about his parent or the teasing that had taken place years ago, instead, his amygdala kicked in and sent him into “fight” mode without him even being aware. The challenging part is that the amygdala is often the dominant part of a child’s brain and “taming it” requires practice. Students who practice mindful awareness are training the brain to slow down and process sensory data. One of the best ways to practice mindful awareness is through deep belly breathing, or brain breaks, as they are called in the MindUP program. Focusing on the breath helps calm the body by slowing the heart rate, lowering blood pressure, and sharpening focus. When children pay attention to their breath, they are also supporting the strong functioning that takes place in the frontal lobes or prefrontal cortex. Controlled breathing also calms the body and mind and decreases the anxiety that sends our amygdala into flight, fight, or freeze mode. This practice primes the brain to be more reflective and less reactive. Over time, this strengthens neural pathways and connections and mindful awareness moves from being a state to a long-term trait. For an excellent video on the connection between the brain and deep breathing, check out this fantastic Dan Siegel Video. Jon Kabat-Zinn, who has written a number of fantastic books on mindfulness for adults, defines mindfulness as, “paying attention in a particular way; on purpose, in the present moment, and nonjudgmentally.” While this is a great definition for adults to ponder, use this same definition with children and you will likely be met with a sea of confused stares. The way we explain mindfulness to students must be much simpler and must be built on a foundation of making connections between the concept of mindfulness and the child’s own life. 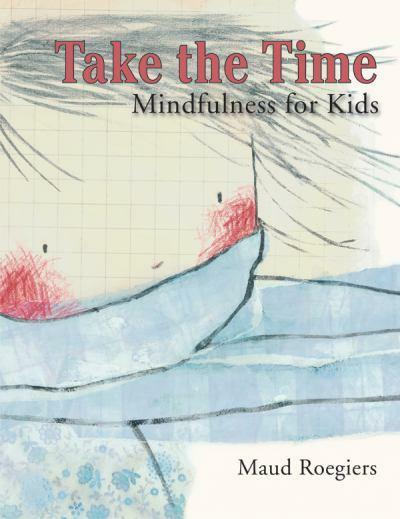 Introducing students to the concept of mindfulness, or to what it means to be mindful, has become a lot easier with picture book authors embracing the topic. 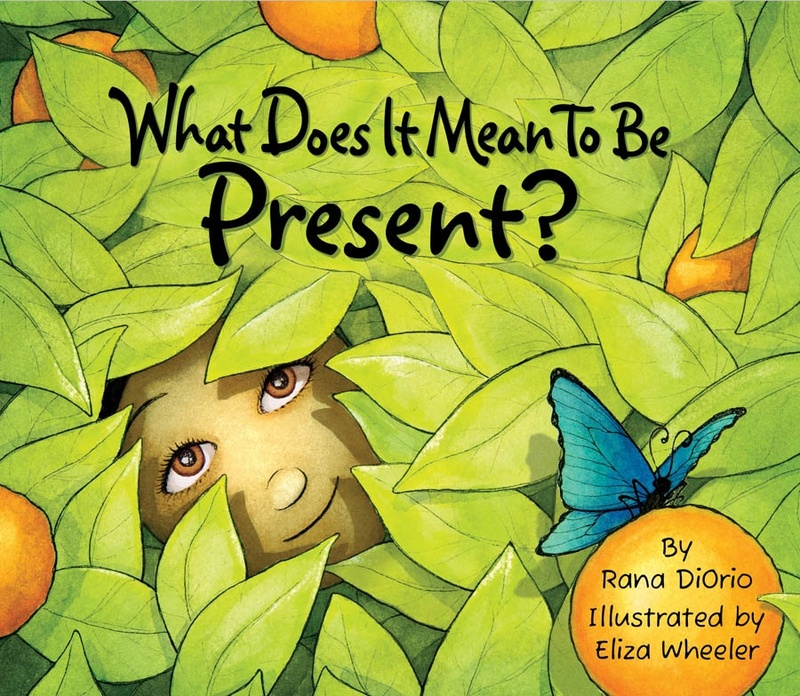 Using picture books to introduce mindfulness gives students a foundation from which to make connections to their own lives and serves as a starting point for rich classroom discussions and activities. While this blog post was going to include my favourite top 5 books on mindfulness, a recent purchase bumped it up to a top 6 list. 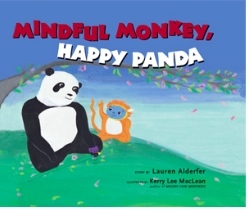 If I were to recommend any book on the topic of mindfulness, Mindful Monkey, Happy Panda is my favourite. In this story, Monkey can’t quite figure out why Panda is always so calm and relaxed. Panda and Monkey compare their day and while their activities are the same, they do them in a very different way. While Monkey is always doing one activity while thinking of another, Panda focuses on the activity he is doing in that moment. Panda explains to Monkey that his problem is that his “monkey mind” is jumping around too much. In contrast, Panda is mindful, which he explains means his “mind” is “full” of the moment. This is a fantastic launching point for an initial introduction to what it means to be mindful. What Does it Mean to Be Present is another favourite. 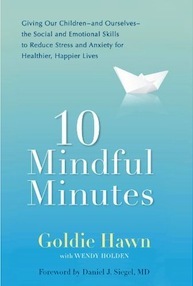 It also serves as an introduction to what it means to be mindful or to be in the present moment. Students learn that being present in the moment is about listening to yourself and others, focusing on the now, being grateful, and learning from mistakes. It is also about slowing down to focus on the beauty that surrounds us each and every day. While Amazon says this book is coming soon, for now it appears it has to be purchased through the publisher “Little Pickle Press,” who also puts out one of my favourite books on the brain, Your Fantastic Elastic Brain. They also sell the wonderful poster pictured at the beginning of this post. For younger children, Take the Time: Mindfulness for Kids is a great book to introduce the concept of mindfulness in a simple way. In this beautifully illustrated story, we follow a small child as they navigate mindfully through the world, noticing the things they feel and experience along the way. 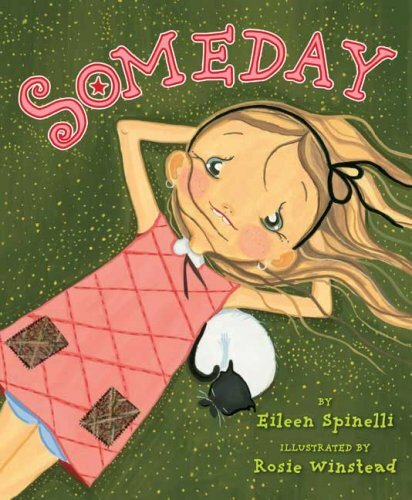 Someday is the story of a little girl who finds herself pulled between the present moment and her dreams for the future. Throughout the book, she goes back and forth between imagining what life will be like when she is bigger, while trying to be content with where she is at in the moment. This book is beautifully illustrated and is rich with sensorial imagery. Someday reminds us that while dreaming big is wonderful, sometimes just enjoying the present moment can be equally as sweet. The Listening Walk is a great introduction to mindful listening or how a simple walk can turn into a lesson in mindfulness. As the little girl in the story focuses on her walk, she is able to hear, see, smell, and experience things she otherwise would not. At the end of the story, the main character invites us all to take a listening walk. 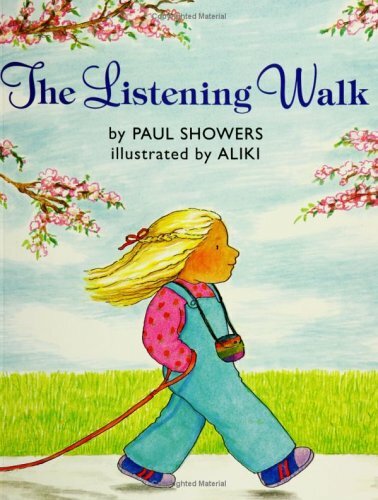 This story serves as a great starting point for a lesson on mindful listening, or for a listening walk of your own. 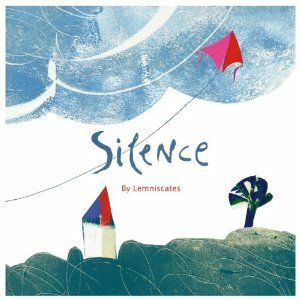 My newest book, Silence, is a beautifully illustrated and gently written book on the power of silence. 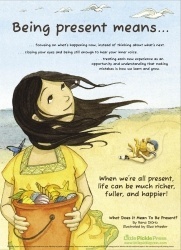 This book encourages children to stop, listen, and reflect on the experiences around them. Using the qualities of mindfulness, readers are asked to pay attention to the things normally drowned out in our busy, noisy world. This story lends to great discussions about the things we experience when we become still enough to notice. Any of these books serves as a great starting point to begin a class discussion on mindfulness and they make an excellent addition to any school or class library. Hands-on lessons to follow shortly. I was recently teaching a MindUp workshop to teachers in my district. A primary teacher asked how to introduce the concept of the brain to young children, or more specifically, the impact of stress, anxiety, and fear on the brain. This is a question I have been asked many times before. From an adult perspective, learning or teaching anything about the brain seems like a complex undertaking. The reality is, we don’t need to be neuroscientists to teach students about the brain or about the impact of stress, anxiety, and fear on brain function. When I teach these concepts to adults, I use the same visuals I would use with a class of middle school students or with a kindergarten class. The key is to provide students of any age with key visuals they can connect to and refer to when needed. In addition to using Dan Siegel’s “Hand Model of the Brain,” which I wrote about in an earlier post, the most successful visual I have found to demonstrate the connection between stress and the brain is by using glitter balls. The use of glitter balls came from Susan Kaiser Greenland. I have included her video clip below. When I demonstrate how the parts of the brain function in both a calm and stressed out state, I begin by explaining that all the pieces of glitter represent the roughly 2000 bits of information our Reticular Activating System takes in each second. When the mind is calm and clear, like the unshaken glitter ball, information is able to pass successfully to the other parts of the brain. If we need to store or retrieve memories, we can access our hippocampus with greater ease. If we need to solve complex problems, make connections, or focus and pay attention, information is able to travel to our Prefrontal Cortex where learning takes place. In contrast, when the mind is anxious or in a state of stress, the mind becomes just like the shaken glitter ball. Information is sent to our amygdala, our flight, fight, freeze center, as opposed to where it is needed to go. Like the glitter ball, the mind becomes cloudy and unfocused, information swirls around, and it is much harder for information to get where it needs to go. Can’t we all think of a time when our mind felt like the shaken glitter ball? I imagine it was hard to focus, hard to remember things, and hard to keep information straight. When I teach students about deep breathing, we look at the glitter ball again. This time, using our breathing, we shake the glitter ball and breathe while the glitter slowly settles to the bottom. This represents the calming effect of breathing on the brain. Students as young as kindergarten can relate to the visual of the glitter ball, and I have seen the image of the glitter ball reappear in conversations and in writing. I remember one of my former kindergarten students, during a particularly tough moment, tell me his brain felt like the glitter ball. His thoughts were swirling around and he recognized he was having a hard time controlling it. If you can’t find glitter balls, making your own is simple enough. Before I came across Kaiser Greenland’s video, I used the jar of thick oil and small beads pict ured at the start of this post. 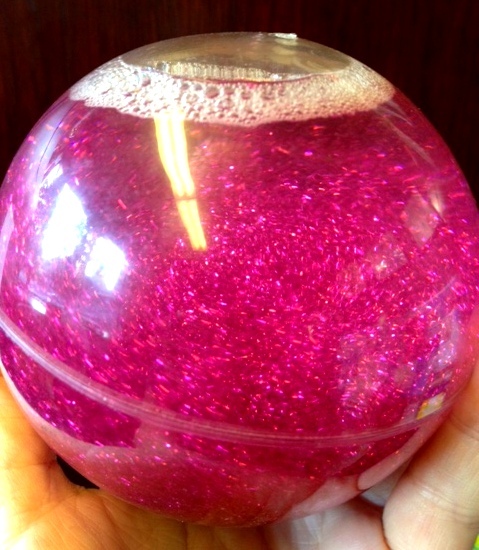 You can also create a more glittery visual by using hot water, food colouring, glitter glue, glitter, and a glass jar. In a small jar, mix a couple of tablespoons of glitter glue with hot water (if water is cold, the glue won’t break down). Stir until the glue is dissolved. Add a drop of food colouring and some dry glitter and shake. For a great book that goes with this concept, try “Moody Cow Meditates.” Since the deep breathing practice (Brain Break) used in MindUP is not considered meditation, I change the book to “Moody Cow is Mindful.” In this great children’s book, Moody Cow is shown how the glitter jar represents his “moody” brain in the same way we teach the glitter jar to students. 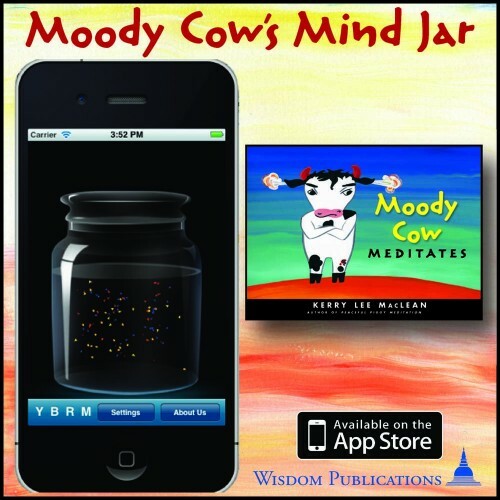 By the way, for those techies out there, Moody Cow also has his own IPad app. 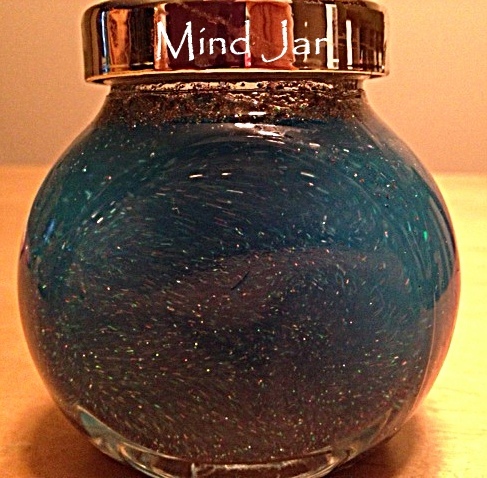 Journaling about a time their own brain felt like the shaken glitter jar. What was going on? What did it feel like? How did they calm their mind? Having students cover a paper circle entirely with glitter glue and then write about things that cause them stress, anxiety, or fear. The paper glitter ball can also serve as the center starting point for a web. 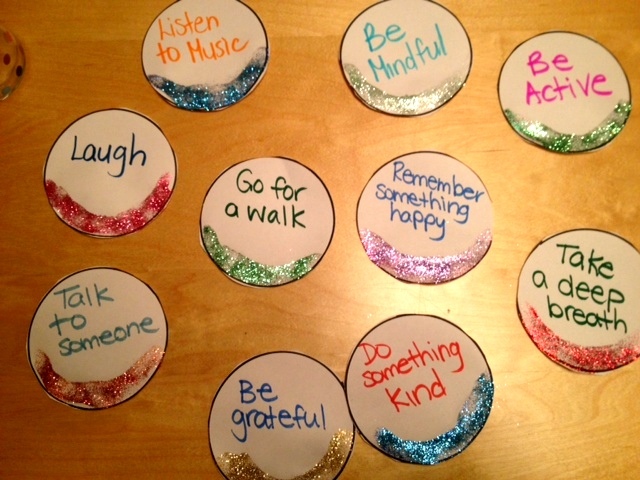 Placing just a small bit of glitter glue at the bottom of a paper circle to represent a calm mind. Have students write about things that calm their mind or complete a similar web to the one outlined above. Brainstorming a class list of strategies that can calm the mind and then writing them on paper glitter balls that can be posted in the classroom for future reference. This is also a great activity once students are farther into the program and have more information to draw on. Having students bring a small jar from home. 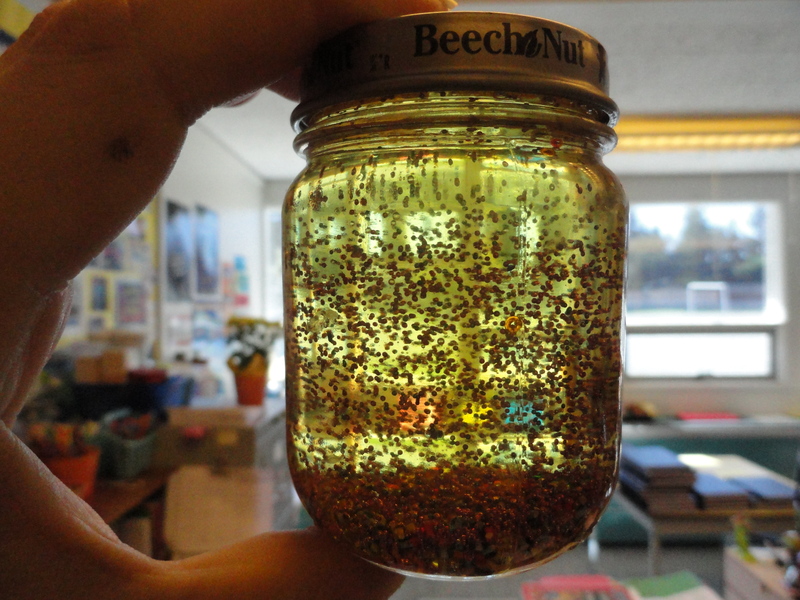 Students can then create their own glitter jar that can be taken home, explained to parents, and left at home for future reference. In short, you don’t need to be a neuroscientist to demonstrate the impact of stress on brain function. No matter how old or young your students, the glitter ball teaches the basics of what students need to know. I also promise you that whether you teach adults, middle schoolers, or kindergarteners, the enthusiastic response is the same. For those students that want to learn more, which some do, you also don’t need to have all the answers. Sometimes questions are the best segue into demonstrating that teachers are learners too. While I feel I have a good understanding of the brain science behind MindUp or mindfulness education, a recent visit to a couple of middle school classrooms in my school left me with questions I couldn’t answer with “complete” confidence. One student insightfully asked whether a photographic memory was an indicator of an overdeveloped hippocampus. Another told me that the reason our flight, fight, freeze mechanism doesn’t always pick the best option is that it is so primitive it does not have the capacity to factor in modern dangers. You don’t need all the answers and, when in doubt, Google! This weekend, I had the opportunity to spend time with other administrators learning about the power of technology from our very interesting guest speaker, George Couros. I left with so many great ideas about how to better integrate technology in my school. I was also left questioning the role of technology in mindfulness education. During the day, I rarely stop using technology, and often that extends into my home life. I hate to admit it, but it is not unusual for me to be watching television, working on my computer, and checking email on my iPhone all at the same time. This is the same thing I see with many of my students. The space our children live in is fast pace and technology has very much shaped how they live in the world. A vast amount of information is just a click away and even communication and frie ndships have gone online. In Goldie Hawn’s book, “10 Mindful Minutes,” she argues that in some ways this has created what she calls a “butterfly brain.” Constantly flitting from subject to subject, we lose focus on the single task. Brain research has shown that this “butterfly brain,” can be toxic to brain development. It has an impact on cognitive functioning, memory formation, focus and attention, and, when socialization predominately shifts online, to the development of healthy interpersonal relationships. With that said, does technology have a place in mindfulness education? After much reflection, I would argue that it does. To argue that technology has a place in mindfulness education may seem ironic, as the two often seem like opposing forces. With that said, technology can also play a very positive role in a child’s education and in the development of a more mindful child. Below are just some of the “mindful” uses of technology in the classroom. I recently watched a fascinating documentary called, “I AM.” It is well worth a watch and can be viewed on iTunes. One of the many powerful messages in the documentary is that the human desire, above all else, is for connection and mutual cooperation. When used efficiently, technology has the capacity to connect us as a community of learners and can also foster a sense of interdependence and cooperation fundamental to any mindful classroom environment. The following YouTube clip illustrates how one school in Hawaii used technology to connect as a school, as well as to their community, to the larger world, and to their own family histories. In our recent technology presentation, our speaker, George Couros, quoted Chris Lehmann when he said, “It is no longer enough to do powerful work if no one sees it.” Our students are a wealth of powerful ideas and their capacity for kindness, compassion, and empathy always inspires me. Technology has provided students with the opportunity to share their thoughts and issues of deep importance to them like never before. One of these students is my friend’s son, Cole Philipp. Inspired by a simple school project on “Paying it Forward,” he took his learning and passion for an orphanage in Mexico to another level. Using what he knew about blogging and social media, he set up a facebook page, created his blog http://www.philipp.ca, and documented his journey. A grand total of $35,000 later, he continues to raise awareness for a cause close to his heart. While Cole raised money for an orphanage in Mexico, former Coquitlam student, Zoya Jiwa used technology to share her struggle with lupus. It was through her experiences that she created her own positive self-esteem program she calls, “Simply You.” Through her multi-media presentations, and her TEDXKids Talk, Zoya now puts on workshops, talks to schools, and works with students to enhance self-esteem and healthy body image. There are many ways to improve brain function, and participating in acts of kindness is just one of them. Each time we do a kind act, we grow our brain’s capacity for care. Dopamine levels rise in the brain fostering a positive mood and increased levels of optimism, energy, and self-esteem. We also know that watching kind acts gives us a similar positive experience. A few years back, a group of School District 43 students, with their counsellor, started Random Acts of Kindness. Before they knew it, Random Acts of Kindness became a nationally recognized day and sparked thousands of people to use technology to document their own kind acts. It was not that long ago, that our world seemed like a much smaller place. The chances of knowing what the average person was doing halfway across the world were nonexistent. Technology has allowed students to connect to the larger world in an unfathomable way. My former leadership students used technology to create presentations on issues affecting students in other parts of the world. YouTube has also provided educators with the opportunity to put a human face to issues plaguing our society both locally and globally. Mrs. Andrews’s Grade 2 class took their passion globally when they used Facebook to create the Kindness Project. 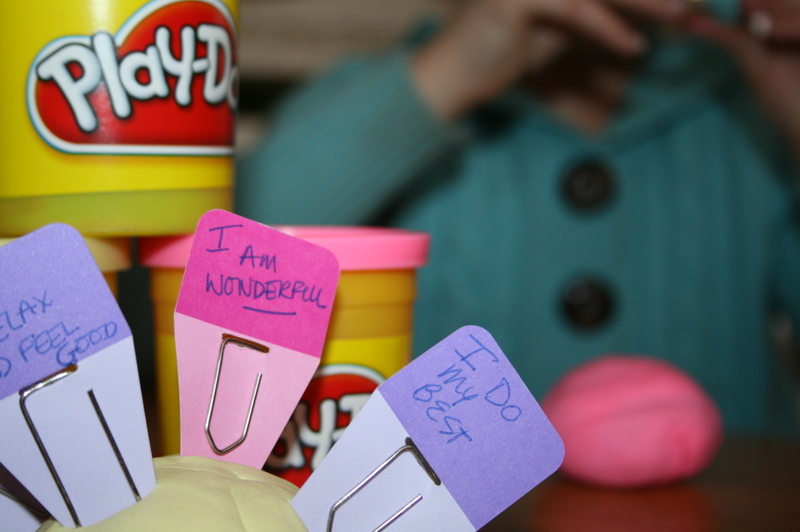 Their goal was to challenge a million people across the world to participate in a Random Act of Kindness. Upon my last check, they had over 16,000 subscribers. Students used this Facebook project to connect to the larger world, explore the countries their followers lived in, and engage in discussion based on the comments and random acts of kindness left on their Facebook page. In this case, the use of social media took the simple message of kindness to a global level and left students feeling they had left their positive mark on the world. One of the biggest goals of education should always be to inspire and engage students in life and in learning. Technology has provided one positive tool for engagement. What we know about student engagement is that when students are fully engaged in an activity, they are most often present in the moment. In addition, when students are involved deeply in their own learning, it has a significant impact on the brain. Involvement in meaningful activities increases dopamine levels which increases alertness, attentiveness, quick thinking, motivation, and mental energy. Meaningful, engaging activities also create a positive association with school and learning, and aid in the rich formation of memories needed for future learning. In the following YouTube clips, two sisters explain how technology allowed them to engage in a deeper understanding of Japanese internment. One of the students explains that in the past, she read a book and maybe completed a worksheet. Using technology, she argues she was able to make much more out of her learning than could ever be demonstrated on a page. While we all need to be mindful of our dependence on technology, and on some of the negative impacts it can have on brain development when used improperly or in excess, the value of technology still exists in any mindful classroom environment. The key is to find a balance between using technology to enhance learning and providing students with the inner tools needed to calm their minds in a very fast pace world. While students can’t slow down the world they live in, mindfulness education is one of the keys to living more successfully within it. 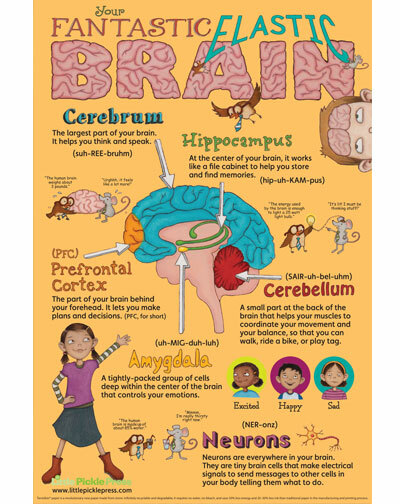 Everything is better with a great book and teaching students about the brain is no different. Books on the brain for students can be few and far between, with most information found between the pages of dense non-fiction material. With that said, I have two favorites that I use with students all the way from kindergarten up to grade 8. 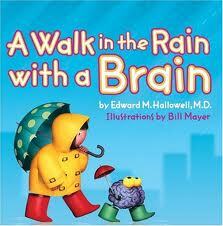 “A Walk in the Rain with a Brain,” by Edward Hallowell, is a great book for younger students. The main message of the book is that “each brain finds its own special way.” The story begins with Lucy, the main character, walking in the rain when she finds a brain sitting in a puddle. The brain asks for her help in finding his way home and, on their walk, Lucy expresses her belief that she isn’t very smart. Fred, the brain, explains that everyone i s smart but just in their own unique ways. He also argues that everyone just thinks and learns a little bit differently. The notion that everyone has unique strengths, and that everyone thinks and learns differently, is a commonly held belief amongst educators. 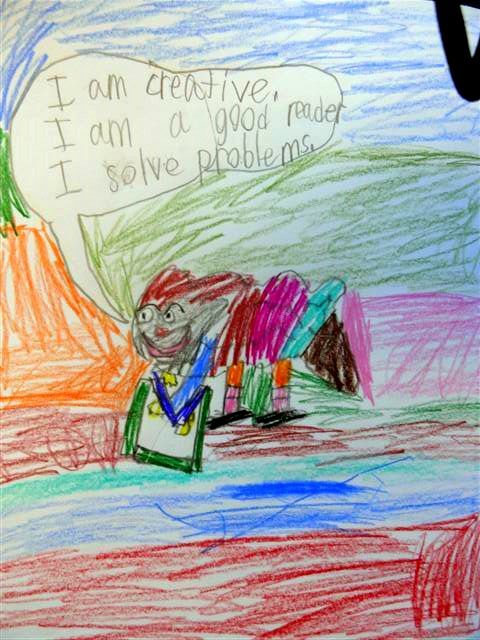 Helping students to discover and utilize their own strengths, while at the same time providing strategies and structures to improve learning is crucial to the positive emotional well-being of children. 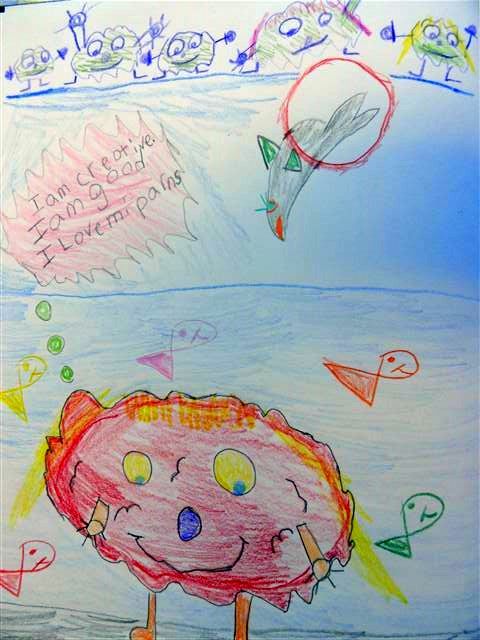 This book provide d the opportunity for students to take what they knew about the brain, and what they knew about themselves, to create their own cartoon brain. Each student spent time brainstorming a list of strengths they had. 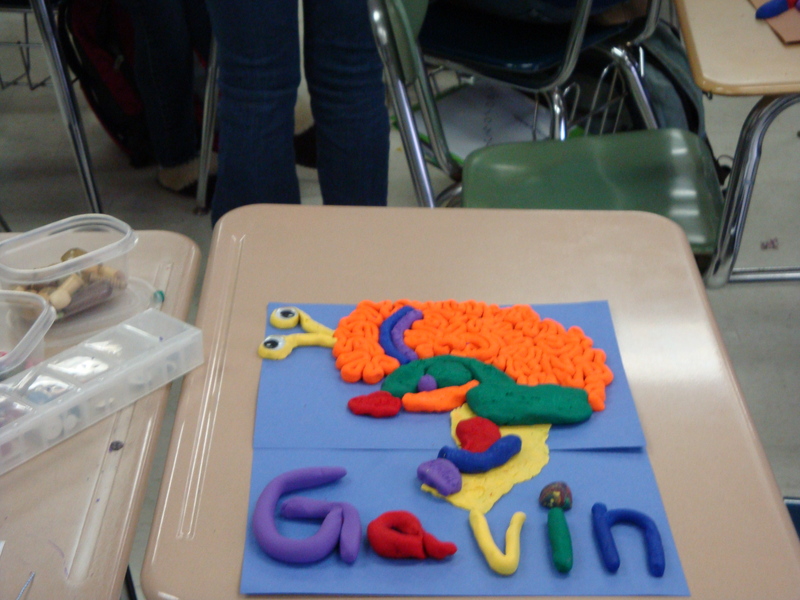 Students then had fun imagining what their cartoon brain might look like. In the end, each brain was an accurate representation of the child and the visual depictions were a general match too. 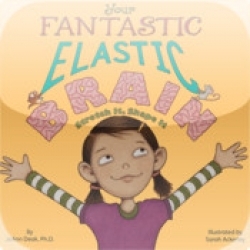 My other favorite book is “Your Fantastic Elastic Brain,” which is published by Little Pickle Press. You can download an activity guide from their site. I love this book for so many reasons. 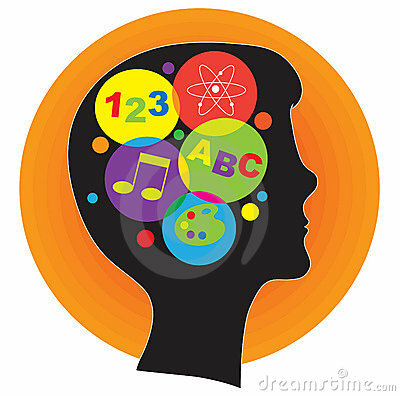 First, it does a fantastic job of introducing the parts of the brain we focus on in MindUp. Second, it explains to children, in a simple way, how we are all born with a brain that is flexible and can be shaped by the things we do each day. To improve our own fantastic elastic brains, the author suggests we try simple strategies such as taking risks, learning a new skill, solving problems, and even making mistakes and lear ning from them. This book can lend to rich discussion whether in a Kindergarten class or in a middle school class. Little Pickle Press also recently came out with a fantastic ipad app to support their book. It does cost a little money to download, but it allows your students or child to participate in the reading of the story. It also includes a wealth of fun activities, games, and journal prompts to stretch your own fantastic elastic brain. Last week, I had the opportunity to spend a block of time introducing a class of grade 6’s to the amazing world of the human brain. I began by telling them a bit about MindUP, and then asked them why they thought we started with the brain. As always, their answers were insightful and showed real thought. One student argued that we need to understand the brain to understand how we learn. Another stated that by understanding how the brain works we are able to make it work even better. Another student argued that everything starts with the brain, which is something I had not really considered. Really, they are all correct. When it comes to MindUP, or being mindful, everything really does center around the brain and how it functions, how it allows us to learn, and how it can be shaped and molded to function more efficiently. 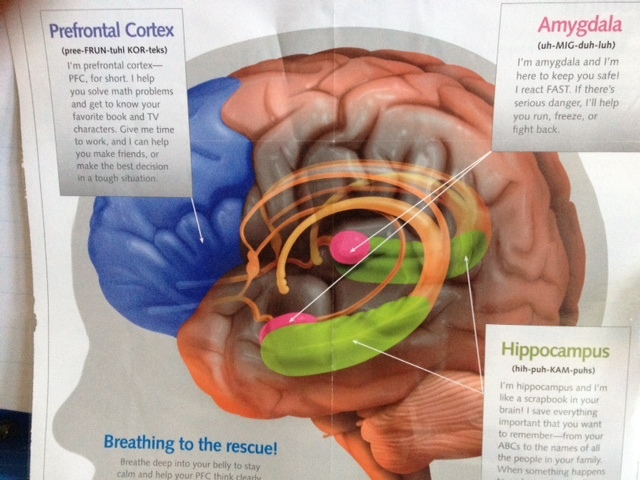 In a single lesson, students learn all about four key parts of the brain. They learn about the prefrontal cortex, which is the learning, thinking, and reasoning center of the brain. They discover the hippocampus, which students refer to as a memory bank where we store and retrieve memory. There is the reticular activating system, which filters information and distributes it to the various parts of our brain. Finally, they learn about the amygdala, which I describe as the security guard for the brain. The job of the amygdala is to protect us and to process danger quickly and efficiently in order to keep us safe. When faced with danger, or a stressful situation, our amygdala tells us to fight, flight, or freeze. Where this information all comes together is how these four parts of the brain interact. This is also where MindUp comes to play. What we know about the brain is that when it is in a state of calm, the reticular activating system is able to process information in a more efficient manner. Information generally gets to the places it is intended and learning is more efficient. When our mind is in a state of stress, it treats everything like a five-alarm fire. At that point, the amygdala kicks into overdrive. Suddenly simple things send the brain into a tail spin and we find ourselves in survival mode. While our amygdala’s are in an overactive state learning is hindered, forming and retrieving memories becomes harder, and focus can be near impossible. As an adult, think of a time when you have faced enormous stress or when life has moved at a pace that seems too fast. Often, we find ourselves in a fog. We can’t remember what we had for breakfast let alone what we were supposed to accomplish in the day. We feel out of sorts, anxious, and muddled. We may even become reactive and snappy to those around us. That is an overactive amygdala at work. Dan Siegel often refers to this as flipping our lids. For a great clip from Dan on the hand model of the brain check out the following clip. 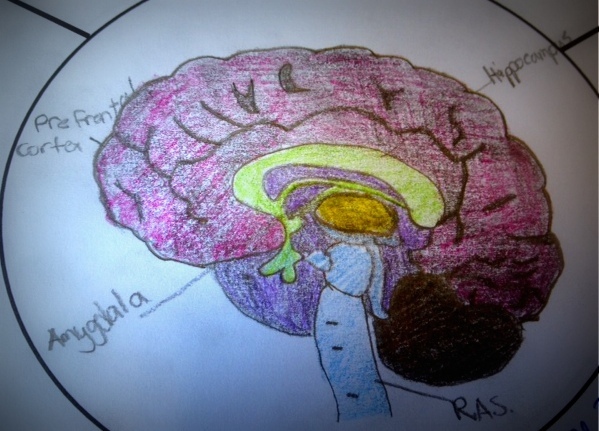 The reason I love this lesson so much is largely based around the insight and connections I see students make between what they are learning and how their brain is functioning. I remember one student, who had a particularly hard time making good choices, approach me with a sense of excitement. The student explained that they had finally figured out why they made so many bad choices. It was because they had a huge amygdala and a teeny tiny prefrontal cortex. In fact, the student was not sure if they had a prefrontal cortex at all. I assured the student that their prefrontal cortex and amygdala were the same size as everyone’s. Rather, what we needed to do was to figure out how he could make each part of his brain function a little bit better. He seemed equally satisfied with the revelation that his inability to make good choices did not have to be a lifelong curse. Understanding our brain is not about making excuses for our behavior. What we know about the brain is that it is constantly changing. This gives hope to our students who find it hard to focus, who find it difficult to make good choices, or who react before thinking. I have seen more than a few of my toughest kids come out at the other end much calmer, more focused, and able to make better choices. Learning about the brain lets them know that their actions may not entirely be their fault but that they have the capacity to train their minds to work for them and not against them. It is like Oprah always said, when we know better we have the chance to do better. Education should be about empowering students and about providing them with knowledge that makes a difference. There is no greater sense of empowerment than to understand how their minds work and to feel a sense of control and ownership over the decisions they make. As they dive deeper into mindfulness education, they will keep returning to what they know about the brain and, in turn, add additional information to what they have already learned. It becomes the foundation for all future work and each lesson they learn focuses on ways to shape the brain to make it calmer and more efficient. Like any new skill, students realize it takes perseverance and practice but in the end it never fails to pay off.